Welcome to the Sinn T2 Blue EZM 15 on silicone rubber strap, featuring an all new 41 mm case size produced by Sinn in-house in Glashutte, Germany. This case is designated with a "T" rather than a "U" as Sinn has chosen grade five titanium as the case metal. 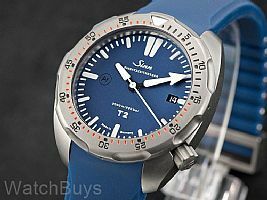 As a Mission Timer and part of the Sinn's EZM line of watches, the new Sinn T2 Blue has been designed from the ground up to withstand the rigors of professional diving use. As such, the watch has been fully tested by all European diving standards and certified by Germanischer Lloyd Hamburg to a 2,000 meter diving depth. This dehumidifying technology uses a copper-sulfate desiccant capsule and inert gas to keep oxygen and moisture from entering the case in order to prevent the premature degradation of the lubricants and oils. 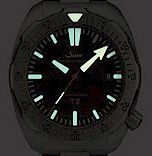 These oils and lubricants are special as well, as Sinn has designed them to provide reliable operation in extreme temperature environments, from 45 C to + 80 C.
The T2 Blue EZM 15 features a striking matte blue dial with date at 3, Super Luminova on the hands and markers. Other features include a domed sapphire crystal with an anti-reflective coating on both sides, and a blue silicone rubber strap with matching titanium buckle. 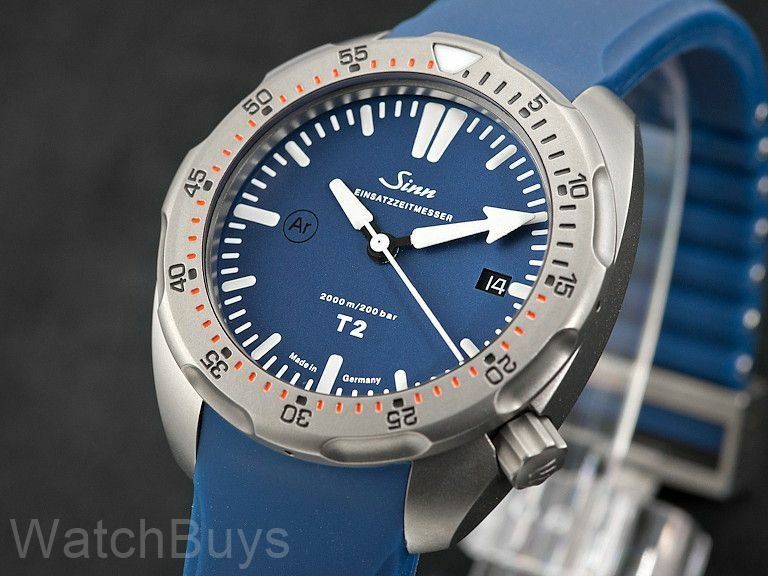 Due to the titanium case construction, the Sinn T2 Blue EZM 15 weighs just 59 grams, without a strap or bracelet attached. Verified Owner Comments: I am enjoying this watch a lot. Adjusting the strap down to my wrist size was a little tricky. I suggest that buyers cut the excess amounts off the strap a little at a time so they don't cut off too much. I cut off just the right amount and the strap (with the excellent buckle) works perfectly. The watch looks great and works quite well. As you might expect from a watch built to go so deep, the crown is a bit stiff, but that is understandable. Sinn watches deserve even more recognition.